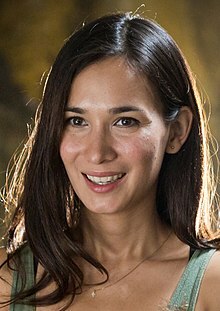 Celina Horan (born 10 June 1985), professionally known as Celina Jade, is an American-Hong Kong actress, singer-songwriter, model and martial artist. Internationally she is best known for her role as Shado (and Mei) in the 2010s CW series Arrow. In China she's best known for starring in the 2017 blockbuster Wolf Warrior 2, the highest-grossing Chinese film ever. Celina Jade was born in Hong Kong to American Kung Fu star Roy Horan and Chinese mother Christina Hui. She was educated in a local Chinese school from kindergarten through high school, and is fluent in Cantonese, Mandarin and English. She learned archery, shooting and Taekwondo from her father growing up. At 14, she left Hong Kong for New Jersey, but returned to Hong Kong shortly after, and attended Island School. She later attended the London School of Economics. She graduated top of her class with First Class Honours in BSc Management. Outside of being an actress, Jade is a vegetarian, a daily meditator and a healthy eating advocate for battling climate change. Inspired by a serious burn accident in 2012, Jade began her journey as a vegetarian and in 2016, worked hand-in-hand with Christian Gerard Mongendre in opening a two floor plant-based restaurant in Hong Kong called HOME - Eat to Live to promote sustainable living and healthier lifestyles. The restaurant closed in 2017. At age 14, Jade won an Asia-wide singing competition, which led to a record deal with Japanese producer, Tetsuya Komuro. Together, they released two EPs, Good News Bad News and 'Kwong Ying Zi Gan'. In July 2000, she performed alongside Namie Amuro in front of President Bill Clinton & other world leaders at the G8 Summit in Okinawa, Japan. At age 15, she had her first number-one hit with the song, "Kwong Ying Zi Gan" in Taiwan. She has since then been featured in multiple ad campaigns for Marks & Spencers, Cathay Pacific, Motorola and Ponds globally. Jade signed with music mogul Paco Wong under Gold Typhoon (EMI) in 2007. She also sang the theme song for Legendary Assassin, "Ceng Jing Xin Teng", which was performed live on TV and radio stations across China. In 2009, she left GoldTyphoon (EMI) and signed with Terry McBride, CEO of Nettwerk Music Group (the force behind Avril Lavigne, Sarah McLachlan, Dido). In 2011, Jade wrote & sang the Mandarin single "Xun Zhao (The Find)" for the web series Wish Upon A Star & sang the theme song "Shi Zhong" with The Wheels. In late 2012, Jade independently released her first self-written album across the internet, Celina. In 2013, Jade was cast as the leading lady in the musical Good Morning Hong Kong which played at the Lyric Theatre in the Academy of Performing Arts. In 2014, Jade recorded a duet "迷彩 Fighting For" which hit No.1 on the TVB8 Chart and won the TVB8 Best Song Awards. The "Fighting For" Music Movie was selected by the Hanoi International Film Festival 2014 to premiere in Asia, and was the only Hong Kong short film to be in competition with 30 other shorts. In 2014 and 2015, Jade supports Maggie's Cancer Caring Center in Hong Kong and offers her singing performances to raise money at the Fayre of St John's yearly event. Other charities & causes supported by Jade throughout the years include Filmaid using the power of film and media to transcend language and literacy, Room To Read focusing on girls' education and children's literacy in Asia and Africa, Bloomberg Charity Day, the Elephant Society working to stop the illegal trade in wildlife and animal parts, Foodlink Hong Kong mitigating hunger, fighting poverty and fostering nutritional wellness in HK, AMFAR supporting HIV/AIDS research, Asia Society forging closer ties between Asia and the West through arts, education, policy and business outreach. Celina Jade and Wu Jing, on the set of Wolf Warrior 2. 2012 Mister French Taste Angie Clarke Episode: "The Job Interview"
2015 Blue Bloods Medical Examiner Episode: "Absolute Power"
2018 Asia's Next Top Model Herself Episode: "The Girl Who Can't Scream"
^ Frater, Patrick (4 August 2017). "'Wolf Warriors II' Star Celina Jade Joins CAA (EXCLUSIVE)". Variety. ^ a b Lo, Andrea (13 February 2014). "Celina Jade". Hong Kong Magazine. Retrieved 19 December 2014. ^ a b "My life: Celina Jade". South China Morning Post. Retrieved 19 December 2014. ^ "Love from Hong Kong: Actress and restauranteur Celina Jade". C-Heads Magazine. 18 August 2016. Retrieved 30 November 2016. ^ a b "Celina Jade Official Website". Celina Jade Official Website. Retrieved 30 November 2016. ^ "LSE Digest 2005-2006" (PDF). ^ "My life: Celina Jade". South China Morning Post. Retrieved 30 November 2016. ^ "Power Couple Christian Mongendre and Celina Jade are Out to Build a Chain of Fast but Healthy Restaurants - Hashtag Legend". hashtaglegend.com. Retrieved 30 November 2016. ^ "K-Pop News 2018: Former Super Junior Member Han Geng Dating 'Arrow' Actress Celina Jade". The Christian Post. Retrieved 2 April 2018. ^ Geb, Ashley (11 April 2013). "An Interview with 'Arrow' Actress Celina Jade". The Daily Quirk. ^ Abrams, Natalie (5 March 2013). "Arrow Exclusive: Celina Jade on Shado's New Partnership with Oliver". TV Guide. Retrieved 19 December 2014. ^ Frater, Patrick (30 April 2015). "Celina Jade To Star in 'April Flowers' (EXCLUSIVE)". Variety. Retrieved 30 November 2016. ^ Frater, Patrick (24 November 2016). "Celina Jade Joins Jacky Wu's 'Wolf Warriors 2' (EXCLUSIVE)". Variety. Retrieved 30 November 2016. ^ "Celina by Celina Jade on iTunes". iTunes. Retrieved 30 November 2016. ^ "Interview with Arrow's Celina Jade | Three If By Space". Three If By Space. 10 December 2013. Retrieved 30 November 2016. ^ "Fayre of St John's 2016 - Hong Kong | Quintessentially". www.quintessentially.com. Retrieved 30 November 2016. ^ HK, Amelie Au @ ELLE. "ELLE.com.hk - 名人時尚：Van Cleef & Arpels 玫瑰金鑽飾熱潮". ELLE HK. Retrieved 30 November 2016. ^ "Room to Read – A Night for Nepal -". Retrieved 30 November 2016. ^ "Photo: Celina Jade for Room to Read". Look to the Stars. Retrieved 30 November 2016. ^ "Instagram photo by Celina Jade • Nov 12, 2016 at 6:34pm UTC". Instagram. Retrieved 30 November 2016. ^ "Foodlink Torq: Ride and Gathering". timeout-admin-node1.candrholdings.com. Retrieved 30 November 2016. ^ "celina jade amfar - Google 搜尋". www.google.com.hk. Retrieved 30 November 2016. ^ "2015 Annual Gala". Asia Society. Retrieved 30 November 2016. ^ Frater, Patrick (24 November 2016). "Celina Jade Joins Jacky Wu's 'Wolf Warriors 2' (EXCLUSIVE)". Variety. Retrieved 25 November 2016. Wikimedia Commons has media related to Celina Jade. This page was last edited on 19 March 2019, at 11:44 (UTC).